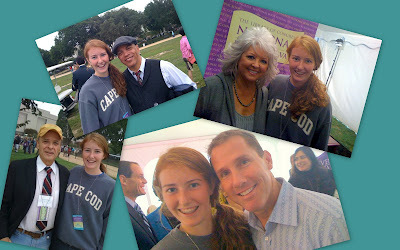 This is a collage of pictures of authors that my daughter Bridget and I met on the Mall today. Clockwise from around the top they are: Ricky Minor, Music Director for American Idol, Food Network star, Paula Deen, Nicholas Spark, author of The Notebook and Tim O’Brien, who wrote The Things They Carried. Each of them was delightful, friendly and seemingly thrilled to meet Bridget. A great day!